How thick must a shield be to be better than no shield at all? [..] For high-energy particles entering dense matter, Bremsstrahlung is joined by pair production, and both together create particle showers. 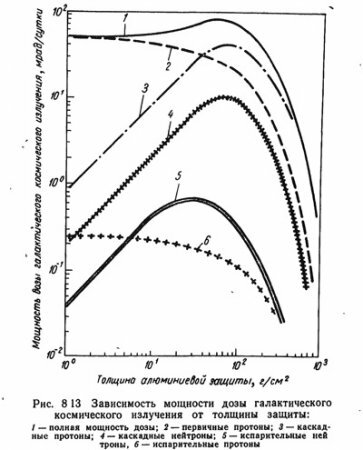 [..] A known problem in radiation shielding (thin shielding might be worse than no shielding at all). Assuming the shield is used on a trip between planets of our solar system and is intended to protect the human crew. I'm looking for both theoretical papers / calculations as well as practical studies (if there are any). other stuff like visible light, IR, UF. X-RAY is not considered here, X-RAY is gamma. The only thing that is important to consider is a nuclear cross section which is different for every type and every protection material. alpha is easy, it's a heavy and well-charged particle. And there is not much of them in the space. The energy of the ones from the space is low. 1 mm of a kitchen tin foil will be a good protection. beta. There are lots of electrons in the space and they can have wild energy, ranging from 10 to 10^20, and this is huge. For example, the large hadron collider at CERN is able to produce just 10^13 tops. There is nothing in the world that can stop such a high energy stuff. However, the good news is that the nuclear cross section of such a high energy particles is relatively small. 3mm of the kitchen foil is enough just as a placebo shield and in order to stop some low energy ones. gamma. this is simple. the heavier the stuff the better. The earth is protected by 10km of air, which has the same level of protection as 10m of water, or 1.4m of steel, or 0.9m of lead, or 0.1m of depleted uranium. Sounds scary but 0.1m of U-238 can be the best option to protect from this kind of radiation. neutron. this is the most difficult one. The best shielding is the light stuff - water, hydrogen, oxygen, graphite, etc. Ideally - by other neutrons. However, the nuclear cross section raises as its energy drops! The slower neutron is the more dangerous it is! Also when a neutron is stopped by some materials like cadmium, the neutron absorption is accompanied by a strong emission of gamma which requires more gamma protection. You can easily google for neutron protection articles like this, but overall, either not protect at all or establish an earth-like level of protection. The earth is protected by ~10 km of air which has about 25% of oxygen, hydrogen, and water. I would estimate that 3m of water will be a good earth-like protection from neutrons. Water is better than other material - it is rich in hydrogen. Overall, 3mm of tin foil + 3m of water + 0.1m U-238 and the Martian astronauts will be just fine. Not the answer you're looking for? Browse other questions tagged crewed-spaceflight radiation interplanetary shielding or ask your own question. Is radiation dose from cosmic rays higher behind 50 cm of shielding, or lower? How can I shield against micro-meteors? How much power would a spacecraft's magnetic shield require? Can a column of water pointed at the sun be used as a shield from solar flares? Would the Moon be a better place than Mars anyways? Why do SD cards perform so much better than SSDs in space? Can an electromagnetic shield protect spacecraft from incoming radiation?